While men typically focus on where the television will go in a home they are shopping for, women tend to picture their family or friends around the dining table as a litmus test for how well they like any particular home. How is your dining table looking for real estate showings? With Thanksgiving on the near horizon for Americans, it's the perfect time to give some attention to your dining room. If your home is for sale, you might want to reevaluate how your dining table looks when buyers AND guests come for the holidays ahead. Wherever you have meals, make that area a place that charms buyers. Make it a spot where they want to celebrate Thanksgiving and other occasions. It needn't be fancy. Most of us don't live that way. The secret is in having just enough details on the table to make it inviting and interesting, without it taking over the entire room visually. I've already blogged here about what place settings should look like in the staged home. If your dining table is the default spot for craft supplies, bills, or homework projects, there's no better time than pre-holidays for staging the area. Since complicated table settings would only be a bother -- especially if you use the table for daily dining -- simple settings are the answer. Placemats, plates, glassware, and napkins might be all you need. And napkin rings give the finishing touch! I like to DIY napkin rings from common materials like ribbon, cheap bracelets, curtain rings, beads, wire, buttons, or cardboard. Making your own is the frugal way to go, and who isn't on a budget when it's time to sell a home? Here's a gallery of ideas for inspiration. These rings, were handmade by Ashley at Little Miss Momma. She credits KoJo Designs for teaching her how. I like that even though each one is a little bit different -- which happens when you use upcycled materials like buttons and brooches -- the twine wrap makes them all similar enough. 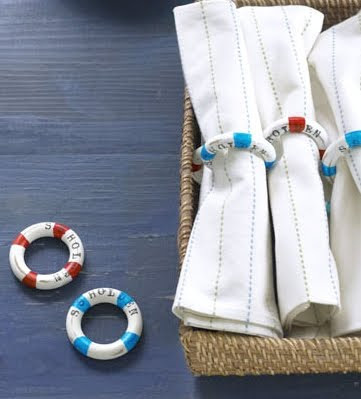 Who would know that these colorful napkin rings began life as toilet paper rolls? Karin at her Swedish blog, Pysselbolaget, shows you how. These are the handiwork of her 8-year old daughter, and I think they are definitely stage-worthy. 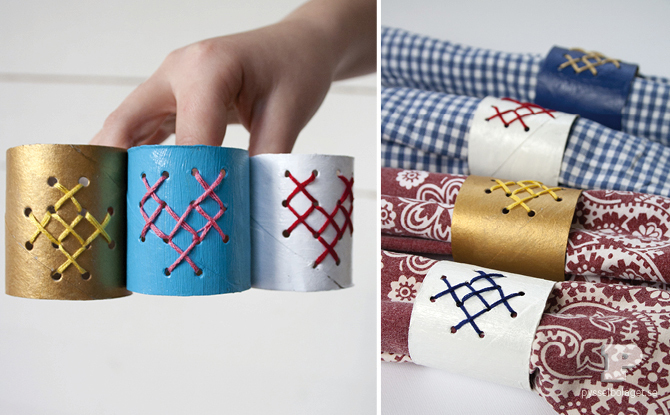 Have some fabric scraps you love too much to discard? Here's another design that began with a cardboard tube, this time the core from a role of Saran. The tutorial at Merriment Design shows you exactly how to. On the left is a sample of Michelle's work, from Sweet Something Designs. She used dollar store napkin rings and covered them with fabric and a button, for a handsome "buttoned-up" look that I love. 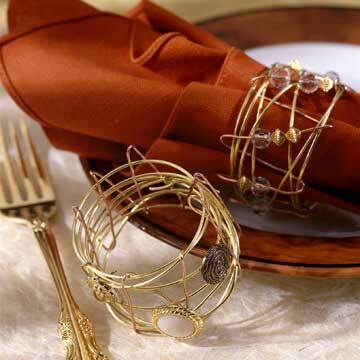 Napkin rings in the staged home shouldn't be so precious that anyone is tempted to walk off with them. I would keep the vintage jewelry and anything else with either sentimental or monetary worth hidden away. You also don't want napkin rings to stand out so much that buyers are distracted from what makes your home valuable -- the size of the rooms, the view, the condition of the floors and walls -- or whatever your home's selling points are. Over at Fidgety Fingers DIY (cute name!) 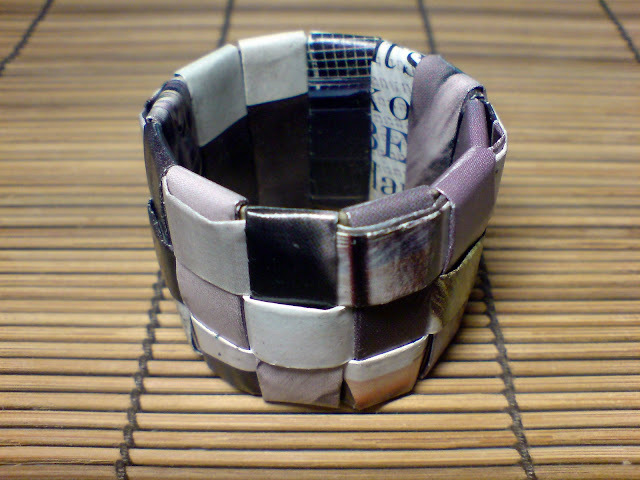 you can learn how to make napkin rings this striking-looking by weaving strips of magazine pages. What could be more economical? Selling a coastal home? How about wooden drapery rings as a start for napkin rings that imitate little life preservers? 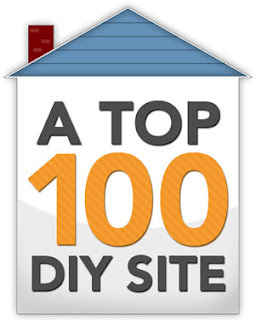 Cathe, at her blog, Just Something I Made, will show you how. Just follow the link! Another beachy rendition comes from The BB Craft Sisters, featured on Design Sponge, where you'll find the tutorial. 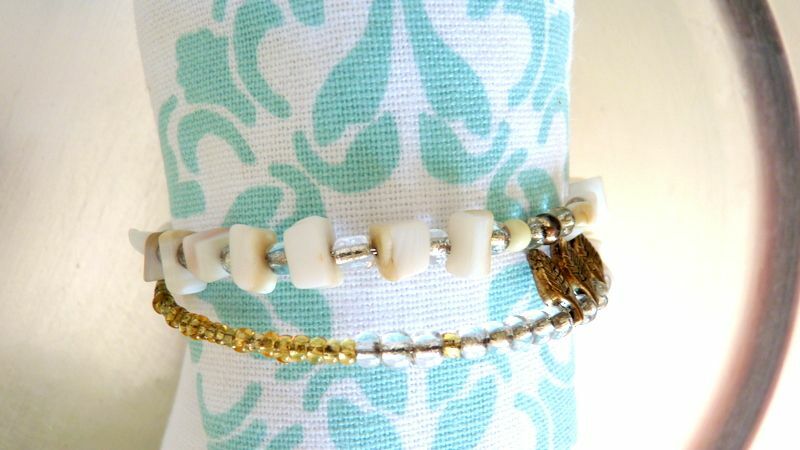 Using rope and collected shells, the look is crisp and clean, and ... well...coastal! 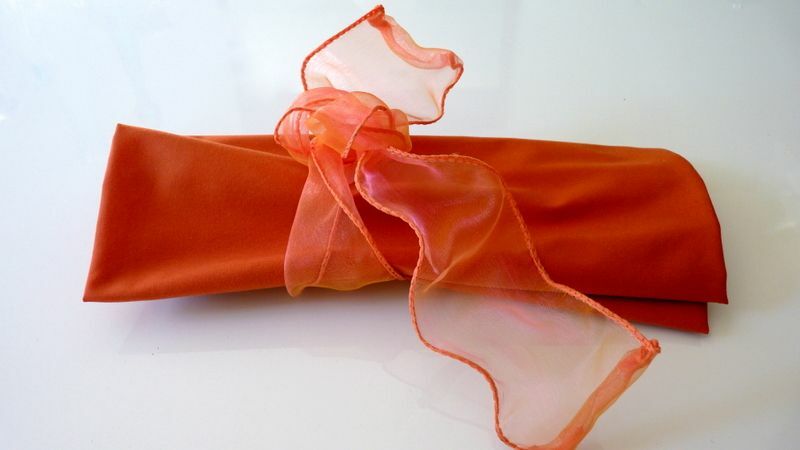 The quickest way to add some height and style to a plain napkin is to wrap it in a second napkin. 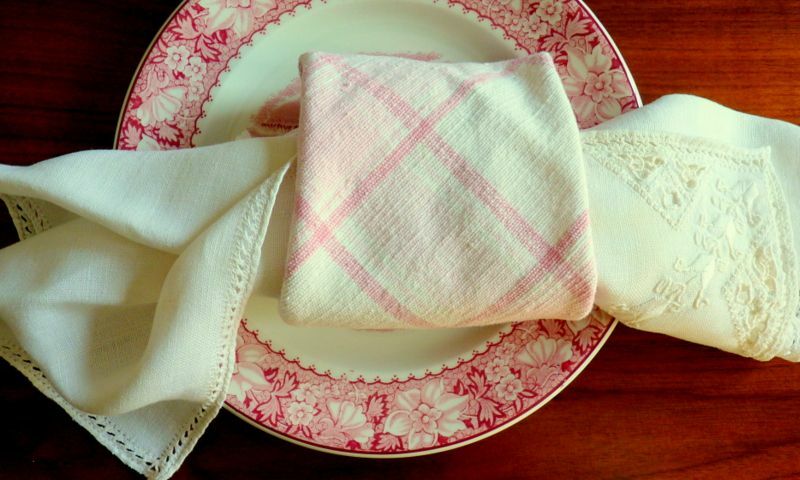 I liked the combination of this gingham napkin with an embroidered linen one. You can go cute and country with this method, or edgey and urban, depending on the fabrics you choose. I made this napkin ring from bracelet memory wire you can buy in the jewelry-making section of any craft store. It's a sturdy wire that has a natural curve to it. You need to use heavy duty wire cutters (n0t your usual jewelry wire snippers) to cut it, and needle nose pliers to curl one end. Then just string on some beads, and curl the other end. 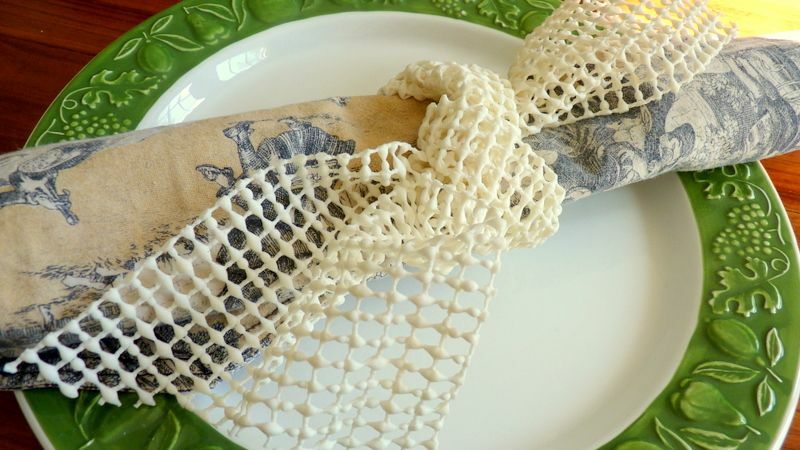 Do you recognize the material I used to make this bow napkin ring? It's the latex waffle pad that keeps rugs in place on the floor, and protects dishes on the shelves. It has the appeal of a natural fiber, but the clean lines of something more contemporary. Great texture, but your only color choice is white. 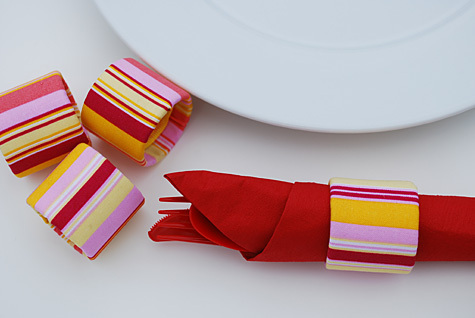 Finally, this unfussy treatment uses wired ribbon to tie up folded napkins for a touch of drama on your table. It's economical and easy. I used sheer ribbon, but any wired ribbon works well, with the exception of glittery ribbon, which I find makes a mess on the table if you're repeatedly removing and replacing your place settings. The finishing touches are what will make your home look interesting and polished. So, don't ignore the razzle-dazzle detail that things like napkin rings bring to the table. Need more tips to get your home market-ready? Just download my $4.99 eBook, DIY Home Staging Tips to Sell Your Home Fast and for Top Dollar, and you'll be on your way to making your home the one that impresses buyers. 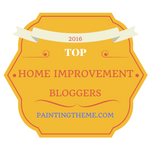 Top photo: Better Homes and Gardens.